With another year almost over and the next already filling up with plans, we are inevitably drawn to the idea of self-improvement and the chance to turn over a new leaf. Hay Hill Gallery’s December show contrasts the chaos and materialism of the festive season with The Heart of the Matter– a collection of meditative paintings by artist Galyna Moskvitina. As we sink under our accumulating things, the simplicity and stillness of her work questions what it is that we really long for- the longing described by T. S. Eliot as a need for ‘further union, a deep communion’. Anthony de Mello wrote that we ‘are born asleep. Live asleep and die asleep… We never wake up. That is what spirituality is about: waking up.’ Like sleepwalkers, we are going through our daily rituals, never quite catching up, hanging on by a thread, suffering the anxious feelings of being. Unsure of ourselves and our surroundings, we build up layers to protect ourselves but the cotton-wool zone quickly breeds apathy and a disconnection with the present moment. The lights are on but no one’s home. Drawing patterns, forming habitual ritual, automatically reacting- we fall into autopilot, repeating the same refrain like a scratched record. The computer is a false window to the world as we pinball between Facebook and Twitter and email. Google and Wikipedia are the go-to brains of choice; ebay and Starbucks consume our wages; television and pub are the blinkered respite. In the attempt to claw back some semblance of control, great efforts are made to maintain a Dry January, the No-Carbs-Before-Marbs bikini diet, and Sober October- before it all implodes at the Christmas party, adding insult to injury with New Year’s Eve just a week later. No wonder you’re exhausted- and beginning to wonder if you’ve completely missed the point of it all. Recent studies have found that alongside the logical and emotional capacities of a human brain, exists an area solely dedicated to spiritual experience. At first, Moskvitina’s philosophy can seem outdated to our fast paced western culture; but the search for meaning, value and purpose is universally relevant- and awareness of that fact is vital to our mental health. In an environment where emphasis is placed on ‘higher’ thinking, (such as meditation or prayer) there are reduced rates of depression and a greater ability to process negative circumstances. For the sake of the whole being, spirituality should not be overlooked but must be considered an essential part of life. The paintings in themselves are mouthpieces for one artist’s spiritual journey; yet these shimmering canvases are also designed to resonate with the individual. Dependent on different shades of light from morning until evening, each work has potential to communicate something unique to the spectator. Having such an encounter in a London gallery may seem strange, but by resolving to stop, stand still for once and really notice, you make space to come up for air. You will finally respond- wide awake. This summer, Baker Street becomes the newest hub for an exciting variety of art in London. Featuring a wide variety of artists selected for their originality and skill, there’s something for everyone at Hay Hill Gallery: fantastical painters such as Peter Blum, David Bowers and Lilia Mazurkevich; smokily atmospheric paintings from Jones Keyworth and Sveta Yavorsky; the geometric designs of Robert Walsh and Marek Dutka. Well-known names include MacAlpine Miller, P.J. Crook, ilia Petrovic and Oleg Prokofiev, alongside up-and-coming artists such as Sopho, Ash and Kenneth Whyte. While there is not an overarching theme, it does appear that each artist presents their own window on the world, making the gallery walls into a shape-shifting kaleidoscope of ideas and personal histories. This is also a chance to see works by Ala Bashir before his solo exhibition at Hay Hill Gallery next year. The artist was born in Iraq in 1939, eighteen years after his country declared independence from Britain. As an artist and physician, Bashir was not only part of Saddam Hussein’s medical team, but once his reluctant confidant too. The resultant works from this period are given shocking context by Saddam’s remark that they would be ‘a record of Iraq at (that) point in history’. Bashir’s style is easily comparable to that of the surrealists, yet these nightmarish visions are not dreams- they depict the very real suffering he was witnessing daily. Unexpected directions in style often make his work difficult to decipher, whilst recurring signs such as the raven and the mask draw directly from traditional Iraqi imagery. Abstract backgrounds eat into the figurative, bricks fuse with skin, snakes fall like entrails from rotting apples. These tortured forms metamorphose into each other, contorted with pain. Bashir paints with great compassion from the devastating perspective of the Iran-Iraq war. Having formerly pioneered techniques for reattaching severed hands, this artist-surgeon now attempts to reconnect the eyes with the heart. During London’s celebrations this weekend, take a detour from your Easter Egg Hunts to admire our window display at Hay Hill Gallery. Discover some true treasures- not your average foil wrapped prizes- but beautiful miniatures that follow an ancient Ukranian folk tradition. 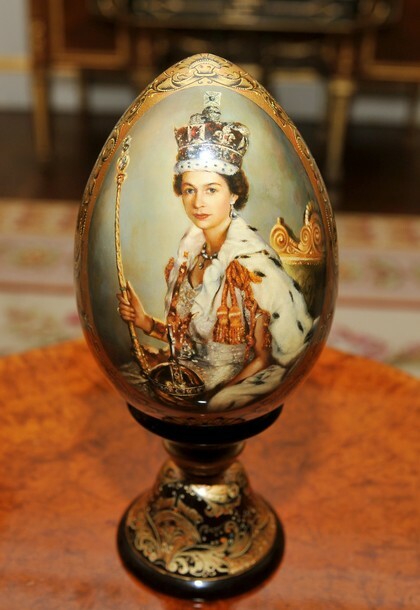 Pictured is one of these ornate objects that was presented to Queen Elizabeth II in 2010. This iconic piece featured in Debrett’s The Queen The Diamond Jubilee publication, and is based on Sir Cecil Beaton’s 1953 wonderfully glittery portrait of our monarch in her coronation regalia. Five years ago, the global financial system was on the verge of collapse, and many now blame Ayn Rand with her principle of selfishness as a virtue. Promoting positive self-interest, her Objectivist ideals divide society into those that have (the rich)- and those that take (nasty little parasites). In this thinking, the government is rendered useless, a burden on society that sets restrictions for its own gains. Hay Hill Gallery brings together two relevantly thought-provoking projects this January; Larry McGinity’s The Financial Crisis Show- Art as a Derivative; and Richard Minns’ Atlas Shrugged sculptural quadrilogy. McGinity’s work sets the scene for a good debate, selecting tasty morsels from financial journalists, MPs and bankers. He wittily records their conflicting explanations and commentaries, opinions straight from the horses’ mouths. Voiced with a myriad of intersecting quotes taken from an extensive range of media, each work considers one particular aspect of the whole sorry tale. The viewer is invited to literally read between the lines where euphemisms are out of context and undermined by themselves. 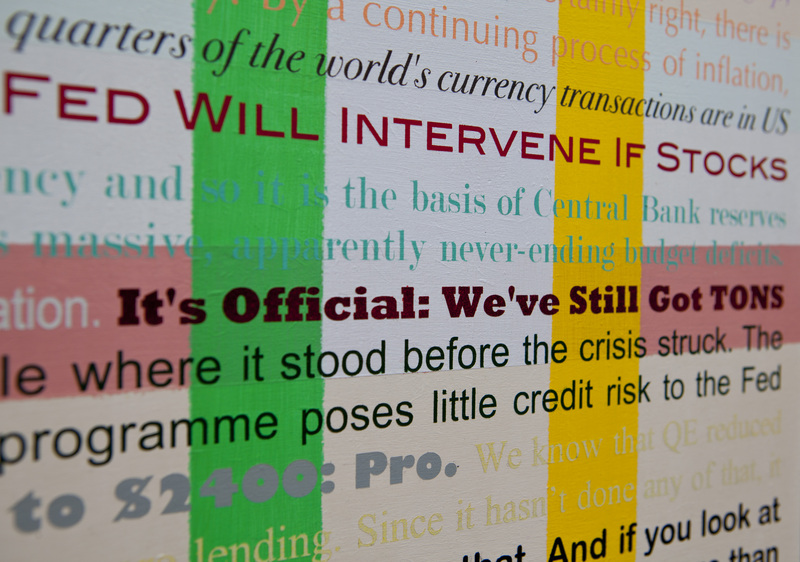 Laid out in broad daylight, these lip-smacking quotes splice the recent events together; colourful excuses rehashed through laser-cut stencils across fourteen panels. Many people trace the problems right back to Alan Greenspan, the chairman of the Federal Reserve for almost twenty years- and a disciple of Ayn Rand. Rand affectionately (ironically?) nicknamed him ‘The Undertaker’. With incredibly strong links to Wall Street, the philosophies of Ayn Rand are now designated scapegoat for the financial crisis- but are these purely criminal banks that have used their evil schemes to gradually straitjacket the market? Or are they enviably brilliant at what they do, fantastical super-banks able to turn their hand to alchemy? As a modern day Atlas, the bankers’ response implies that the victims should not have been so stupid as to hop on board in the first place. Minns’ perfectly illustrates Ayn Rand’s ideals from a believer’s point of view with his Atlas Shrugged series. Atlas is the manifestation of life lived separate to the government, firm in his belief that the antidote to this vicious circle of financial control/ crisis/ control is laissez-faire Capitalism and rational self-interest. Unable to bear the weight of the world and its freeloaders, he exerts individual force to shatter the state of total collectivism and live freely within a Capitalist ideal that supports itself. Unshackled from the old world of purposelessness, Atlas manipulates it for his own purposes, a new kind of hero formed of human potential. This struggle of individualism versus collectivism is not actually intended to be a political ideal but concerns the soul. The individual is of supreme value, the “fountainhead” of creativity; Selfishness, properly understood as ethical egoism, is a virtue. Ayn Rand’s influence is perhaps not entirely to blame for our limping society. These results are a product of an already unhealthy culture being forced into a painful shoe that does not quite fit- the free market. If free markets could be trusted to police themselves, would her theories save us? Randian disciples believe that following her to the letter would lead to economic growth and much higher standards of living. So, now that we know what the risks are, have we learned enough from our glaring mistakes?